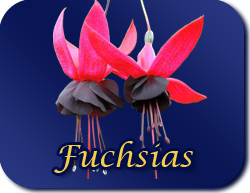 We are Fuchsia specialists and have been growing our enormous range for many many years now. Please choose from the categories below to view the slideshows and comprehensive variety lists, all available at Mount Folly during the season! We grow 350+ varieties of Fuchsia! Most varieties of Fuchsia on our list are available during the growing season from March to May. Trailing Fuchsias are mostly used in hanging baskets but those labelled as ‘Lax Bush’ are also suitable for larger pots and containers. Our mother plants which are grown in 3lt (19cm) pots are replaced annually and the current seasons mother plants are put on sale in the nursery. These have been constantly cut back as we take cuttings, consequently making exceptionally bushy plants. One of these planted directly into a 14” or even 16” basket makes a fabulous display. Hardy Fuchsias are deciduous shrubs and are planted directly into the flower border. They can be planted in pots and containers, but be aware that the frost can penetrate to roots more easily, so the pot may need insulation for the winter months. Our mother plants which are grown in 3lt (19cm) pots are replaced annually and the current seasons mother plants are put on sale in the nursery. These have been constantly cut back as we take cuttings, consequently making exceptionally bushy plants. Pot or Bush Fuchsias are upright but are mostly non-hardy varieties, so to be sure of keeping them they will need frost protection during the winter. They can be used in mixed hanging baskets as well as larger pots, containers or flower beds. Our mother plants which are grown in 3lt (19cm) pots are replaced annually and the current seasons mother plants are put on sale in the nursery. These have been constantly cut back as we take cuttings, consequently making exceptionally bushy specimen plants when planted. Great value at around £5.99 each. A Great way of raising money for charities around the country. An idea launched at Chelsea Flower Show several years ago that has raised £1000's as part of the price gets donated. There are some great names as well as flowers with this selection.